Five girls. A paper dress. Tons of shoes. One unforgettable raincoat. White Jeans. Secrets. Drama. Friends? For Justine, Bianca, Becka, Polly, and Anne, living in Westfield, New Jersey is "life on planet toilet paper." At least that's how Justine feels when she shows up as the new girl in school wearing a Scott Paper Caper dress. To her, it's a super-original fashion statement. But other "loser freaks" don't agree. The other girls have their own fashion issues, ranging from fabulous boots to raggedy pajamas to what to wear to therapy. Told in alternating voices, TALES FROM MY CLOSET follows the stories of high school kids who have nothing in common--and everything in common. They're at war with each other, but through their clothes, they reveal and conceal themselves and make peace with what it means to be a teen. Over the course of a school year, their individual struggles and successes come together to tell a story that's funny, honest, and all-girl fabulous. Jennifer Moses is a writer whose byline and media presence have touched the lives of teens for more than two decades. Her articles, essays, short stories and columns appear regularly in THE NEW YORK TIMES, THE WALL STREET JOURNAL, THE WASHINGTON POST, GOOD HOUSEKEEPING, and more. 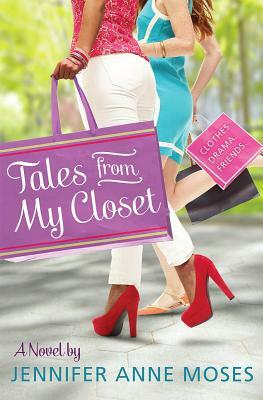 In TALES FROM MY CLOSET, Jennifer draws from her experience as a frequent NPR-trends commentator and lifestyle reporter. She lives in Montclair, New Jersey, with a closet full of to-die-for clothes.